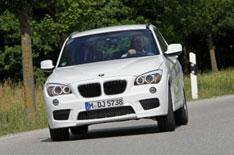 62mpg+ BMW X1 on the way | What Car? BMW is to introduce a new fuel-efficient X1 to its range. The two-wheel-drive X1 sDrive20d Efficient Dynamics Edition is powered by a 161bhp four-cylinder turbodiesel engine, it averages more than 62mpg and emits 119g/km of carbon dioxide. Modifications over the standard X1 to achieve the high mpg include brake-energy regeneration, engine stop-start, lighter alloy wheels and reduced-rolling-resistance tyres. Pricing and on-sale dates are expected to be announced tomorrow (Friday).